Meet the Mets, for New York's NL squad has introduced, and replicated, the fourth out play—Replay Review style—which we'll dub the "false fourth out," named so because this unique play resulted in a failed run actually scoring while a trailing runner was declared out when the defense, sensing that a third out call at home plate may be subject to Replay Review, played upon a trailing runner to secure a fourth out in the event that the third out at home were to be overturned (which is precisely what happened). False or reverse fourth out: a logical proof. 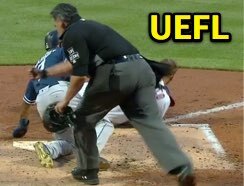 Today's Ask the UEFL column utilizes a logical proof to find out what exactly is and isn't legal here—it's a real headache, considering that two out of the three codes fail to formally recognize that which umpires have stipulated for generations: A half-inning cannot categorically end until the potential for a fourth out or similar appeal has ended. By now, we've run through our fair share of fourth out plays (defined in Official Baseball Rule 5.09(c) as a play in which the defense appeals that a runner who scored prior to the third out, which was declared upon a trailing teammate, has committed a baserunning infraction, such as leaving early on a caught fly ball or failing to touch a base, such that this "fourth out" supersedes apparent third out on the trailing runner and, thus, the cancels the apparent run), but now it's time to meet the Replay Review version of this extra out. First, the terminology. Since this isn't an appeal play—it's simply a play on a runner—this isn't a true fourth out play, as in 5.09(c). This is a simple "tag the runner off the base" play, as in 5.09(b)(4), so we'll call it a "false fourth out." Sidebar: For an example of a "real" and old-fashioned fourth out play, see the following related post. Related Post: UEFL Series: Baseball Rules in the Real World (Fourth Out) (1/18/14). The History: Shortly after expanded instant replay's invocation in 2014, an April contest between the Braves and Mets first drew our attention to false fourth outs when, with two outs and one on, a ground ball to the second baseman and close play at first base where the batter-runner was ruled out by 1B Umpire Eric Cooper, gave way to a play at third base on lead runner R1. Umpires discussed the '14 false fourth out play. That's right: Although Braves first baseman Freddie Freeman drew an out call from Cooper on the batter-runner for the third out of the inning, he nonetheless threw the ball to third base, where third baseman Chris Johnson tagged out Lucas Duda for the potential fourth out of the inning. Satisfied with Cooper's call at first base—not that any potential runs could have been scored on the play—Mets Manager Terry Collins opted not to challenge, but had he challenged, and had the play at first base been overturned, the Braves' election to pursue a false fourth out at third might very well have ended the inning regardless. Related Post: Baseball Rules Series: Replay's New Normal (Fourth Out) (4/19/14). 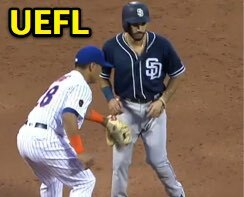 The Play: Fast forward to Tuesday, July 24, 2018, also at Citi Field, when Padres Manager Andy Green challenged the following play in the top of the 3rd inning of the Padres-Mets game: With two outs and the bases loaded, Padres batter Wil Myers singled on a line drive to left fielder Michael Conforto, baserunner R3 Austin Hedges scoring easily. 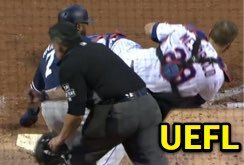 Conforto threw to catcher Devin Mesoraco in an attempt to retire baserunner R2 Manuel Margot, attempting to score from second base, ruled out on Mesoraco's tag by HP Umpire Manny Gonzalez for the apparent third out of the inning. The Mets played on R1 after the third out. Sensing a false fourth out play and challengeable call at the plate (i.e., that the runner might have actually been safe), catcher Mesoraco continued playing and threw to third baseman Phillip Evans as Padres baserunner R1 Carlos Asuaje, having seen HP Umpire Gonzalez's third out call, slowed up and jogged into Evans' halfhearted tag, observed by 3B Umpire Laz Diaz as a potential fourth out. The Replay: When video replays conclusively indicated that baserunner Margot was safe at home plate, the Replay Official quickly overturned that element of the play before turning his attention to third base, whereupon he applied a reverse fourth out of sorts to baserunner Asuaje, thus declaring Margot safe at home on the Mesoraco's missed/late tag and time play, and Asuaje out at third base for the official third out of the inning—the opposite, or reverse, of what usual fourth out appeals look like. If Replay Review results in a change to a call that had been made on the field, the Replay Official, to the extent feasible, shall exercise his discretion to place both Clubs in the same position they would have been in had the call on the field been correct. This shall include placing runners where he thinks those runners would have been at the conclusion of the reviewed play if the reviewed call had been correctly made in the first instance. Ok, so if the Replay Official thought that the trailing runner would have been out at third had the correct call (in this instance, "safe") been made at home plate in real-time, then declaring said runner out as a result of the overturned call is the proper move. But what if the umpire's incorrect call (or mechanics) caused the trail runner to alter his behavior? e) "whether the incorrect call affected the subsequent behavior or conduct of the offensive or defensive players." To summarize, the Replay Official is essentially tasked with mentally simulating what would have happened had the correct call been made, and may allow a call subsequent to the initial incorrect call to stand if the Replay Official believes that this subsequent call was not affected by the initial incorrect call. 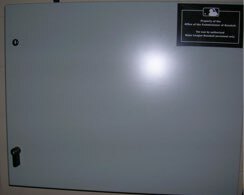 Little did MLB know, it was Pandora's box. The Problem: The aforementioned principles are fairly easy to grasp when overturned calls occur with less than two out, but what if a third out is part of the equation? The initial incorrect call here results in the third out of the inning, and Regulation IV.A.4. states, "The Replay Official may not declare a runner out based on a play the umpire believes would have occurred subsequent to the play subject to Replay Review." The Point: So what's the big deal? The defense threw to third anyway and got a fourth out. That's not a play that "would have occurred"—that's a play that actually did occur. The Counterpoint: The fact that the umpire declared the third out means the inning is over, so any action that follows the third out is no longer an actual play—it's now a play that "would have occurred" and by rule the Replay Official can't declare a runner out based on a play the umpire believes "would have occurred." These are both solid arguments, but which is correct? The Proof: The primary argument against declaring the "fourth out" runner going to third out on review is that the play technically didn't occur since the apparent third out at home plate killed the inning or otherwise caused the half-inning to end. Yet this is not accurate and makes an underlying assumption that is not true regarding when the ball becomes dead—though it is supported by a series of odd and largely inapplicable rules and interpretations, which we will refer to momentarily. We know that when the ball is dead, no bases may be run and no runs scored, or outs recorded except for actions which occurred while the ball was live (the specific rule here is 5.09(b)(4): "a runner is out when—he is tagged ,when the ball is alive, while off his base")...but does the third out actually cause the ball to become dead? Rule 5.09(e) states, "When three offensive players are legally put out, that team takes the field and the opposing team becomes the offensive team." Furthermore, 5.09(c) regarding appeals states that any appeal of a violation that "occurs during a play which ends a half-inning, the appeal must be made before the defensive team leaves the field." Rule 5.09(c) Comment also states, "Time is not out when an appeal is being made." We've long known that professional baseball requires live ball appeals (as opposed to dead ball appeals in NFHS). Yes, the ball can stay alive after out #3. Thus, time is not out simply because the third out has occurred. In this case, time is only out when the defense has left the field, thrown the ball out of play, etc. 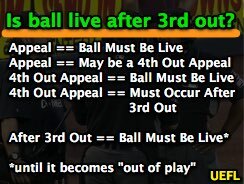 And we know this because the ball is always live when an appeal is made and if the ball is always live during an appeal, and an appeal can occur after the third out of the inning, then, transitively speaking, the ball must be live during an appeal effected after the third out of the inning. Since the defense leaving the field, the ball being taken out of play, etc. is what usually happens after the third out, it's not too far of a leap to lump in "third out" and "dead ball" together, but, as Rule 5.09(c)'s fourth out illustrates, the ball remains live in the immediate aftermath of the third out. It becomes dead as the result of an action that could potentially occur simultaneously with the third out being recorded, but the act that causes the ball to become dead is not the third out itself. The Counterpoint view that equates "third out" with "dead ball" is not entirely illogical, either, though it is not always true. After all, only NCAA acknowledges that the half-inning is not over until the fourth out potential has concluded—even the high school rule, which is fairly detailed, fails to formally acknowledge that the half-inning does not always end upon the third out, and the only OBR interpretation related to when a half inning begins pertains expressly to situations concerning curfews and time limits. OBR: [Not Covered, but interpreted as, PBUC, in the specific context of curfews and time limits...]: "An inning or half inning starts immediately after the third out is made in the preceding inning." The third out does not "kill" the inning. Ever since replay came to the big leagues, however, it has been all but codified in actual rules and interpretations that a half-inning does not end upon the third out, so long as a manager is able to challenge a call. Instead, the Replay Review regulations introduced a new term to the rules lexicon, one that existed in broadcasting for quite some time: that of the "inning break," a purgatory state between two half-innings that, by rule, does not begin until the manager has either decided not to challenge a third out call, or the challenged call has resulted in the third out of the inning (II.E.1). Thus, if the "inning break" cannot commence until a play is either challenged or accepted as final, then it logically would follow that the entirety of the preceding half-inning has not, in fact, ended until finalization of the third out, which means F2 is legally allowed to play on R1 as a false fourth out based on his belief that the play could be challenged and the call overturned. "A DEAD BALL is a ball out of play because of a legally created temporary suspension of play"—thus, the inning break, and not the third out, creates this temporary suspension of play. Conversely, "a LIVE BALL is a ball which is in play." Got it? In = Live, Out = Dead. As Manny calls "out", F2 isn't playing on R1. Putting it another way, if the third out truly ended the half-inning at the moment of the out, then the accompanying photograph of the plate umpire calling the runner out while the catcher is sprawled on the ground, prior to his play on R1, would indicate that the Replay Official was incorrect in overturning the call at third base and, moreover, and more to the point, that all fourth outs would be impossible given the inning's conclusion at the moment of the third out due to appeals' requirement that the ball remain "in play." Accordingly, if there is a continuation of play that results in the apparent third out of the inning—such as a fourth out appeal or false fourth out that keeps the ball "in play" like that which occurred in New York Tuesday night—the ball remains alive until such time as playing action has ceased and the defense has left the field (or the ball has become dead for another cause, such as being removed from the playing field, expiration of the Replay Review decision-making time limit and the inning break's commencement, etc. 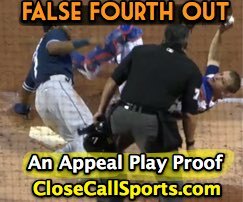 ), at which time the Replay Official simulates what would have happened had the initial incorrect call been a correct call, knowing full well that F2's actions in securing a false fourth out indicates that, had the correct call been made, the third out likely would have been made at third base. Conclusion: Because time is not out in the immediate aftermath of the third out, this affords the Replay Official discretion to call the baserunner jogging toward third base out on a false fourth out tag attempt, thus scoring the run while declaring the trail runner out and, finally, judging the inning to have concluded.